Ok so I'm normally not a big shopper but today I grabbed a steal. 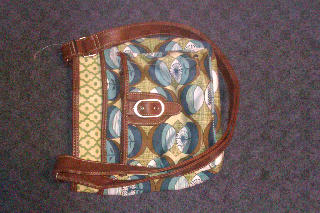 This purse was on sale for just $15 at Target...gotta love their sales racks! On another note, I apologize to everyone for my lack of posting. I did receive a full time job so it's definitely taking some adjusting. But with the pay increase, and with some fighting with T Mobile, I was able to secure an Android phone with a cheap plan. Now I can take pictures and write posts from my cell phone (like this one). So expect shorter posts with more pictures for a bit. This is the new era of The Thrift World....and I hope you like it! Thanks for reading!